WITH DISNEY PRINCESS LOOKS, four wins on Food Network’s Cupcake Wars, a bustling gluten-free bakery in Oregon’s Lake Oswego, and a sweetness that parallels her Gluten-Free Chocolate Peppermint Mousse Pie, Kyra Bussanich is living a fairytale. But all was not always sugar dusted and cherry topped. Like most classic stories, Kyra’s is an epic tale of triumph over adversity. Though in her version, the villain is not an evil stepmother or witch, but Crohn’s disease combined with a gluten-rich diet. Kyra had been feeling ill for nearly all of her life when she received an official diagnosis in 1998, at the age of 20. She didn’t need to learn what the inflammatory bowel disease meant for her—her gastric pain and distress was so intense, she spent much of her time gasping in pain, curled up in a fetal position or lingering in the bathroom. Unfortunately, identifying her ailment didn’t improve matters. She spent the next several years in and out of hospitals, downing a cabinet’s worth of medications, receiving an infusion of a drug called Remicade every six weeks, and ultimately taking additional pharmaceuticals so potentially damaging, she was required to get her brain and liver tested every three months. By the time the doctors recommended the next course of action—removing her intestines—the monthly cost of her medications was twice her mortgage payment, and she was losing hope. As Kyra tells it, at that point her options were waiting for death or undergoing surgery—with the exception of a last-ditch nutritional Hail Mary recommended by her mother, who is gluten intolerant and has Hashimoto’s disease, a condition where the immune system attacks the thyroid and creates chronic lymphocytic thyroiditis. Her mom had experienced marked improvement on a gluten-free diet, due to its anti-inflammatory properties, and thought it could help her daughter. In 2006, Kyra gave it a try. She was skeptical that a single dietary adjustment could have much impact and didn’t think she could maintain a gluten-free diet for even a month anyway. But almost immediately, she experienced her first glimmer of hope: “I woke up one day and realized I didn’t need to take a nap after I took a shower,” she marvels. She waited for the pain to resume, but it never did. Within a month, Kyra was able to breathe through a normal conversation and sit upright for extended periods of time. That was all the encouragement she needed. As life became more manageable, she pushed hard to establish some normalcy. “I didn’t want my symptoms to become who I am,” she explains. With a new gluten-free lifestyle and a desire to master the art of baking classic breads and desserts “the right way,” Kyra dove into a traditional French patisserie program at Portland’s Le Cordon Bleu College of Culinary Arts. Though she wasn’t able to taste what she made, she got a firm understanding of the roles ingredients play in baking. From that, she extrapolated how to keep structure and flavor in desserts without using wheat and got busy baking for friends, and later strangers, seeking better gluten-free desserts. After graduation, Kyra furthered her experience as a pastry chef at Bruce Carey Restaurants’ consortium of Portland-area eateries. There, she worked under hot young chef and Frice Pastry founder Alissa Frice, who encouraged her creativity and taught her about balanced composition on the plate. When an opportunity to compete as the first GF baker on Food Network’s hit TV show Cupcake Wars arose in 2010, Kyra leveraged these skills to secure the win over gluten-friendly competitors. Soon, she was receiving order requests from viewers around the country. 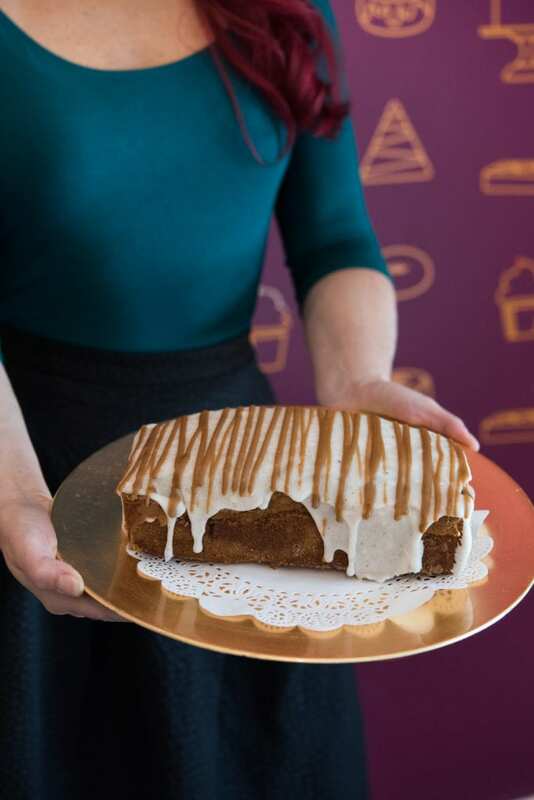 To satisfy the demand, she founded a website selling gluten-free baked goods, and later opened an instantly successful 750-square-foot bakery about ten miles outside of Portland. 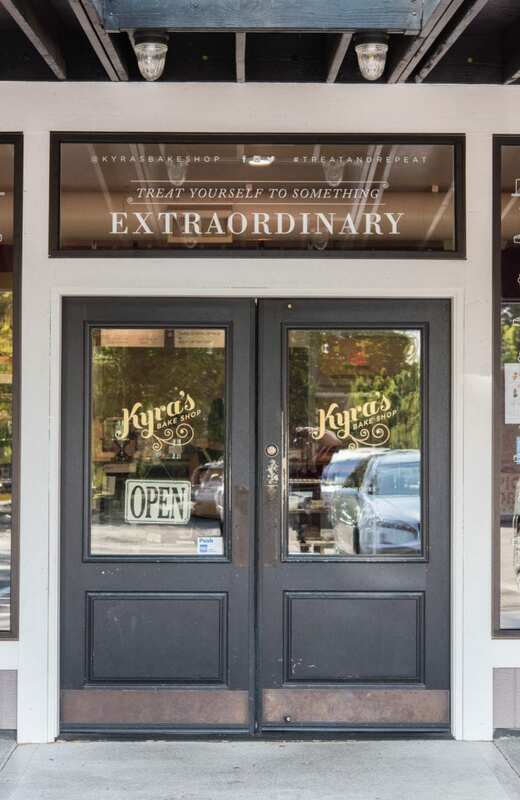 In Thanksgiving 2014, after two additional Cupcake Wars wins and four years in her bakery, Kyra’s Bake Shop moved to a nearby space five times the size of the original. 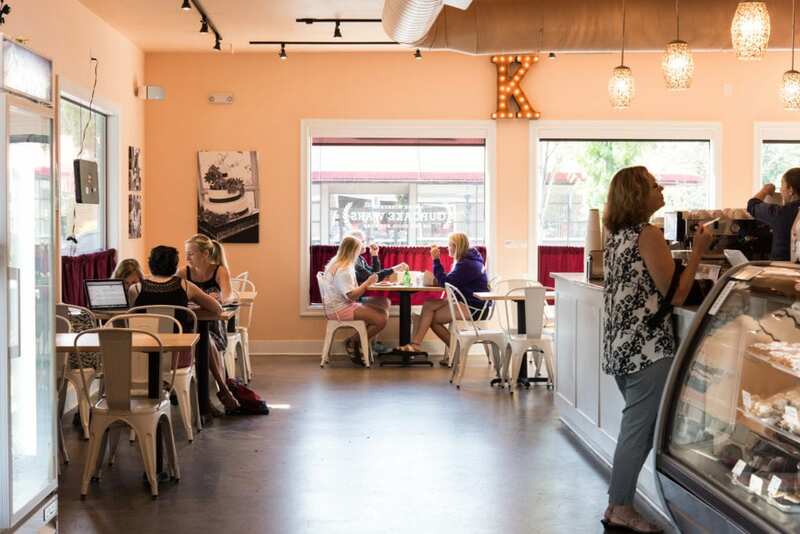 With indoor and outdoor seating, a full lunch menu and coffee bar, cocktails, and a vast and ever-changing array of Kyra’s ultrasweet, creative, “rustic chic” GF baked goods, it’s a gluten-free haven for any sweets lover. It’s also where you’ll find Kyra, medication- and symptom-free, perhaps whipping up a batch of curry-laced vanilla cake with chipotle-salted-caramel filling and ginger mascarpone frosting. Now that’s sweet revenge.